MONDAY MARCH 11 (West Harrison, NY) – On a frigid, blustery day at Silver Lake Park in West Harrison, New York, the Westchester Community College Baseball team’s bats were nearly as cold as air temperature, until a late rally during the second game brought life to a talented offensive team. On Tuesday, two Viking pitchers not only made their WCC debut, but they made quite the statement, combining for back-to-back complete games and 20 total strikeouts as Westchester CC swept the Monroe College JV team, 4-2 and 9-1 to open the season 2-0. The first win of the day also gave Head Coach Billy McClure his 300th career victory at the Westchester helm. The opener was an old-fashioned pitcher’s duel that featured few hits, a lot of small ball, and brilliance from freshman hurler Michael Cox (Cortlandt Manor, NY/Walter Panas HS). The rookie struck out six batters over the first four innings, 13 in total, did not walk a batter, and had it not been for a WCC error in the fifth inning, he would have pitched a shutout. Instead, Cox’s misfortune turned into a big play for Monroe later that inning as a two-run home run cut a Westchester lead to 3-2. However, in the bottom of the sixth inning, freshman CJ Spence (Mount Vernon, NY/Mount Vernon HS) belted a run-scoring double to make it a 4-2 game. That is all Cox would need as he mowed down Monroe in the top of the seventh inning, striking out the last two batters to secure the victory. Five different Vikings had one hit, including a Steve Guzman (Bronx, NY/John F. Kennedy HS) RBI single in the first inning to open scoring. Also for Westchester, sophomore Sean Vanegas (Bronx, NY/Mount St. Michael) had a hit and two runs scored. The nightcap featured a nightmarish start for Westchester as eight of the first nine Vikings to come to the plate struck out, and a long third inning home run for Monroe seemed to put the Mustangs in command. However, sophomore Josh Rosario (Poughkeepsie, NY/Spackenkill HS) settled in beautifully after allowing the run. He did not allow a hit the rest of the way, struck out seven total batters, walked only one, and earned the complete game on only 78 total pitches. Westchester tied the game in the bottom of the fifth inning when sophomore Steve Messerschmitt (Carmel, NY/Carmel HS) scored on a error. Then, one inning later, the Viking bats exploded for eight runs, the biggest of which was a bases-loaded triple by Vanegas to clinch a mercy rule win. Westchester pounded out eight hits, including a 2 for 3 game by Guzman, and freshman Tyler Mandel (Scarsdale, NY/Scarsdale HS) had a hit, and scored two runs. TUESDAY MARCH 12 (Valhalla, NY) – When the sun set on a cold and blustery day at Silver Lake Park in West Harrison, New York on Tuesday, the fact that he had won his 300th career game as Head Coach of the Westchester Community College Baseball team was of minimal importance to Billy McClure. That is, because Tuesday’s match-up with Monroe College was a doubleheader and the day would not have been a success to Coach McClure without walking away with career win #301 as well. An eight-run bottom of the sixth inning blew open a 1-1 tie in the nightcap. The Vikings got a 9-1 mercy-rule victory over the visiting Mustangs at Westchester CC’s home away from home during the early part of the baseball season, and McClure headed home having reached a coaching milestone that few ever approach, having amassed win #300 during the first game of his 10th year at the Westchester helm – a 4-2 victory. It was a moment McClure waited forever so patiently after earning his 299th win at the Region XV Championship Game on May 14, 2018. Not only did he have to endure the long off-season, but also a string of 14 games postponed or canceled to open the 2019 campaign due to poor weather or field conditions. The moment finally came on Tuesday afternoon, and in typical Billy McClure fashion, handled it with the highest level of humility, as Coach McClure had to be talked into taking a celebratory photo, instead wanting to focus on preparing his team for the next game. After McClure’s first season as Head Coach in 2010, Westchester CC has won every Mid-Hudson Conference Championship, except in 2014. Westchester CC has earned the Region XV Championship six times during McClure’s nine seasons as Head Coach, including the last five. McClure Region XV Baseball Coach of the Year on six different occasions. The 2014 team finished with a 33-17 record, and advanced to the NJCAA National Championship Tournament for only the second time in program history. During his tenure, McClure has coached 60 All-Region players – five voted Region XV Player of the Year. Five NJCAA Baseball All-Americans have competed for Coach McClure at Westchester Community College. The list of Westchester CC Baseball alumni who have advanced to compete at a four-year school is too long to count. As of March 12, 2019, Coach McClure’s career record is an incredible 301-133, meaning that he has won just below 70% of his games as Head Baseball Coach at Westchester Community College – a winning percentage that would be legendary at any level of sport. He is the all-time career wins leader in Westchester Community College Baseball history. McClure’s accomplishments have been so vast as a coach, mentor, and member of the community (he is currently a Sergeant in the North Castle Police Department) that the Westchester County Board of Legislators proclaimed that June 15, 2018 was “Billy McClure Jr. Day” in Westchester County. In addition, with a seemingly long career at the Westchester CC helm remaining ahead of him, it is certainly a safe bet that Coach McClure’s laundry list of accomplishments will only continue to grow. In fact, based on recent trends, there is a chance that his successful run as Head Baseball Coach at Westchester Community College is only in its early stages. WEDNESDAY MARCH 14 (Brooklyn, NY) – If an early-season scouting report exists on the Westchester Community College Baseball team, it very well may be to survive the sixth inning if an opponent wants to have a fighting chance at victory or maybe avoid the frame altogether if that were somehow possible. Three times this season, the Vikings have entered the sixth inning of a game with the issue very much in doubt, and three times Westchester has blown the game wide open during the sixth inning to earn a trifecta of victories to open the 2019 campaign. This time around, it was an incredible 16-run rally during the top of the sixth inning at Kingsborough Community College that blew the doors off a game that had been neck-and-neck throughout, extending a 3-2 WCC edge into a 19-2 advantage. Despite a rough bottom of the inning, Westchester emerged victorious, 19-6 to improve to 3-0 during the 2019 season. How good has Westchester been during the sixth inning of games thus far? The Vikings have scored 32 runs thus far this season. Twenty-five have come during the magical sixth inning. On Tuesday, Monroe College had scored twice to come within a single run of Westchester during the 2019 season opener, but a key insurance run gave Westchester the buffer they needed to close out their first win of the year. Later that day, Monroe and Westchester entered the bottom of the sixth inning tied 1-1 before an eight-run Viking rally turned a tight game into a mercy rule win..
At Kingsborough, 21 Westchester batters came to the plate during the sixth inning, which could very well be a Westchester CC record for single-inning offensive success. Sophomore Steve Messerschmitt (Carmel, NY/Carmel HS) alone enjoyed an inning for the ages, coming to the plate twice during the frame, and blasting a triple, followed by a double, both of which plated two runs, and he scored twice as well. Freshmen Tyler Mandel (Scarsdale, NY/Scarsdale HS) and CJ Spence (Mount Vernon, NY/Mount Vernon HS) also had two-RBI hits during the offensive barrage in the sixth inning. Kingsborough’s rally during the bottom of the sixth inning came via the benefit of four unearned runs, but was not enough to avoid a mercy rule defeat. For the game, six Vikings had multiple hits as Spence went 3 for 4 with two RBI’s and two runs scored, Mandel went 2 for 4 with two RBI’s and two runs scored, and Steve Guzman (Bronx, NY/John F. Kennedy HS) went 2 for 4 with two RBI’s. Tyler Parshley (Carmel, NY/Carmel HS) and Hailyn Gonzalez (Bronx, NY/Bronx Envision Academy) also collected a pair of hits, and Parshley scored three runs for the Vikings. Sophomore Dylan Sabia (Mahopac, NY/Iona Prep) earned his first career win for WCC, pitching five strong innings, allowing two earned runs, while striking out six. Messerschmitt also pitched a stellar bottom of the sixth inning, coming in after Kingsborough had rallied for four runs, and he retired all three batters he faced to close out the win. THURSDAY MARCH 14 (West Harrison, NY) – Down to their last out of what would have been a crushing early-season defeat, with just a couple of key plays, and the most incredible of bullpen appearances, the Westchester Community College Baseball team turned a possible bout with adversity into the kind of moment that could define their season. Sophomores Steve Messerschmitt (Carmel, NY/Carmel HS) and Luis Gomez (Bronx, NY/St. Raymond) combined for six shutout innings. Sophomore Tyler Parshley (Carmel, NY/Carmel HS) capped off a wild opening game with a walk-off RBI single as the Vikings came back to beat Monroe College JV, 6-5 in 13 innings on Thursday at Silver Lake Park in West Harrison, New York. After a 5-3 nightcap win, Westchester is now 5-0 to open the 2019 season. The opener looked like Monroe College (0-4) had a win in the bag as the Mustangs entered the seventh inning with a. 5-3 lead, and their closer on the mound. However, the Vikings did not go down quietly. In fact, they did not go down at all. Consecutive singles by C.J. Spence (Mount Vernon, NY/Mount Vernon HS) and Tyler Mandel (Scarsdale, NY/Scarsdale HS), and a Monroe error put runners at the corners with one out. A Steve Guzman (Bronx, NY/John F. Kennedy HS) sacrifice fly made it a 5-4 game, but also brought the Vikings to their final out. That is when things got wild. A Messerschmitt walk put runners on first and second base with two outs. During the very next, pitch to sophomore Joe Desanctis (Brewster, NY/Fox Lane HS), the Monroe pitcher balked, and putting runners on second and third. Two pitches later, Desanctis grounded the ball to third base, and the ball promptly booted for a game-tying error, which ultimately led to extra innings. Finally, the game ended in the thirteenth frame, with Messerschmitt once again in the middle of things. After he opened the inning with a walk, followed by a Michael Cox (Cortlandt Manor, NY/Walter Panas HS) walk to put runners at first and second base. Up came Parshley, who ripped a single to right field to score Messerschmitt and end the game. Aside from his heroic efforts on the mound, Messerschmitt went 2 for 5 with two walks, and RBI, and a run scored. Spence went 3 for 4 with three walks, an RBI, and a run scored. Also for Westchester, Parshley and Mandel each had two hits. Gomez earned the win in relief, capping off a stellar effort by the Viking bullpen, as they did not allow a single earned run over nine innings of work. The nightcap saw Westchester score three times in the opening inning, and never look back, thanks to a dominant complete game performance by Optaciano Polo (Yonkers, NY/Cardinal Hayes). After the Vikings had to go to the bullpen for nine innings during the opener, Polo gave WCC exactly what they needed for game two, as he was simply dominant. Over seven innings, Polo allowed only two runs, struck out 11, and walked only two batters to give Westchester a commanding win. It was a 3-2 Westchester lead heading into the bottom of the third inning when Sean Vanegas (Bronx, NY/Mount St. Michael) singled home a run with he bases loaded, and Jhojandy Hernandez (Bronx, NY/Salesian) followed with an RBI walk to make it a 5-2 game, which was all Polo needed. Seven different Vikings combined for eight hits, with Guzman racking up two of his own, and Parshley, Vanegas, and Hernandez each had an RBI. SUNDAY MARCH 17 (Nyack, NY) – The Vikings wore festive green hats, celebrated plenty by scoring 33 runs over two games that were shortened by run differential, and WCC caught so many big breaks that it can be said that they had the ‘luck of the Irish’ on their side, combining for only 14 hits while scoring all of those runs. Ultimately, Westchester capped an impressive first week of the regular season with a 16-3 and 17-3 sweep of visiting Holyoke Community College at Nyack High School. With the wins, Westchester CC is now 7-0 to start the 2019 season. The opener featured a breakout performance by sophomore Steve Messerschmitt (Carmel, NY/Carmel HS). The lefty, who has done just about everything to help the Vikings this season, enjoyed a monster day at the plate, going 2 for 2 with four RBI’s, including his first career home run – a three-run monster blast in the third inning – to make it a 14-1 game. Westchester scored six runs in the opening frame, and five each during the next two innings to put the game away quickly. Aside from Messerschmitt’s heroics, sophomore Steve Guzman (Bronx, NY/John F. Kennedy HS) went 1 for 2 with two walks, two RBI’s, and three runs scored, while Miles Haughton (Mamaroneck, NY/Mamaroneck HS) had two RBI’s and three runs scored, and Jhohandy Hernandez (Bronx, NY/Salesian) had three RBI’s. The offensive explosion was more than enough for freshman Michael Cox (Cortandt Manor, NY/Walter Panas HS), who earned his second win of the season. The lefty pitched a complete game, allowing only one earned run on five hits, and he struck out eight to improve to 2-0. The nightcap proved to be a completely different story for much of the game. Westchester opened the contest with a four-run first inning – without benefit of a hit – two runs coming on wild pitches. After that, the Viking bats fell silent for nearly the entirety of the next three innings as Holyoke attested a valiant comeback. In the top of the third inning, Holyoke looked like a comeback was imminent, when Holyoke hit an extra base hit with the bases loaded, and it looked like two runs scored to make it 4-2, and would have been closer had Haughton not thrown a runner out at the plate. However, on appeal, the field umpire ruled that one of the Holyoke run scorers missed third base, erasing a run from the board and the Holyoke rally. A Westchester run via stolen base in the bottom of the fourth inning made it a 5-2 WCC lead, and after Holyoke scored a run in the top of the fifth inning to make it 5-3. However, Westchester scored an incredible 12 runs during the bottom of the fifth inning to end game via run differential. The key blow was a bases-loaded triple by sophomore Sean Vanegas (Bronx, NY/Mount St. Michael) that cleared the bases. Westchester combined for only 7 hits, but 12 Holyoke walks, three errors, and two Viking batters hit by pitch proved to give WCC the offensive catalyst they needed. Vanegas had four RBI’s, to finish the day with seven, while seven different Vikings scored two runs apiece. Sophomore Max Marienberg (Scarsdale, NY/Scarsdale HS) earned his first win of the 2019 season after allowing only one unearned run during the final two innings of the game, striking out two. 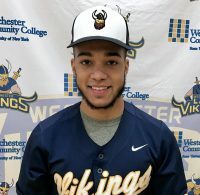 (Cortland, NY) – Westchester Community College Baseball alumnus Brian Corporan (Bronx, NY/HS for Environmental Studies) named the SUNYAC Baseball Athlete of the Week for the week ending March 10. Corporan, who competed for the Vikings during the 2016 and 2017 seasons, is a junior on the SUNY Cortland Baseball team, currently serving as the team’s Designated Hitter. For the season, Corporan is leading the Red Dragons in batting average (.458) and slugging percentage (.875). He also has accounted for two home runs and seven RBI’s. Playing one of the most ambitious schedules in Division III Baseball, SUNY Cortland currently 7-6-1, ranked #16 in the nation according to D3Baseball.com.